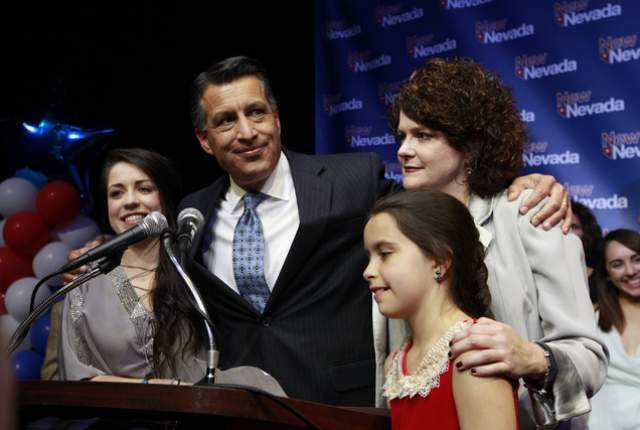 Governor Brian Sandoval, his daughters Madeline, left, Marisa and wife Kathleen appear during the Nevada Republican Party election night party on Nov.
Last June, on a school playground in Las Vegas, a Republican governor plopped into a chair before a folding metal table, applied a gray pen to a slip of paper, and broke into a jaunty grin while a throng of elementary students clapped politely. With that signature, Brian Sandoval passed part of an education package derived from an enormous tax increase well north of a billion dollars, the largest tax hike in the 151-year history of Nevada. Since then, Sandoval has found himself somewhat lonely on the Republican stage—which is ironic, perhaps, for a handsome, hugely popular Latino star in a party eager to showcase its Hispanic credentials, a man who has been leading a state that has been thoroughly combed for months by Republican presidential candidates ahead of the Nevada caucuses on Tuesday. 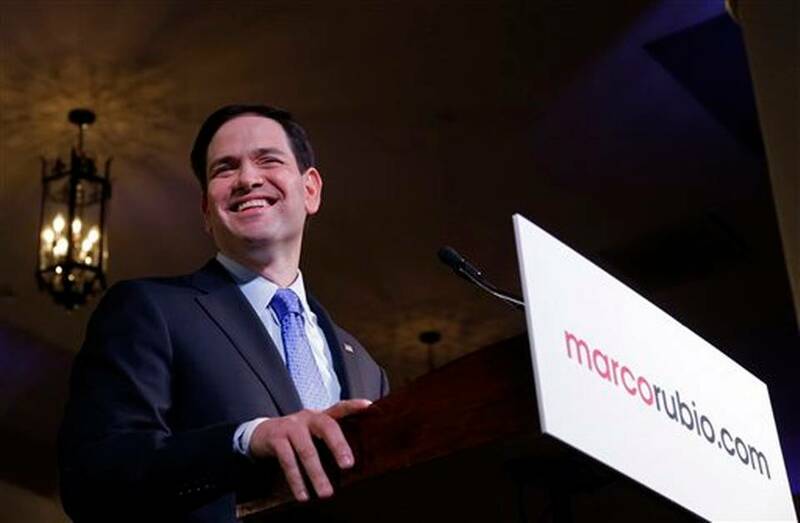 Only a week ago in South Carolina, the endorsement of another high-wattage GOP star, Nikki Haley, was huge news and may well have turned the tide of the race—or at least driven Jeb Bush out when Haley crushed his hopes by endorsing his rival Marco Rubio. But the courting of Sandoval, if you can call it that, has been a far more subtle affair for the GOP presidential candidates. He is in the unenviable position of being seen as an ideological apostate who simultaneously boasts approval ratings in the high-to-mid 60s. When the general election comes, Sandoval’s endorsement will be desperately needed; Democrats privately fear he could be a potent weapon to drive Latino and Hispanic turnout. But in an unpredictable and highly partisan GOP caucus, with many conservative Republicans alleging betrayal by Sandoval over his historic tax hike and threatening revolt, the endorsement of the Nevada governor is seen as more of a headache than a helpmate. And no one is quite sure what to do about him. “There’s way more opposition to the governor within the Republican legislative caucus than the Democratic one,” says David Damore, a professor of political science at UNLV. 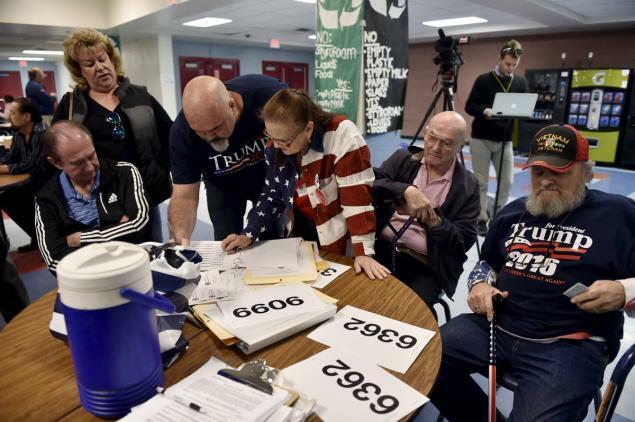 “He’s by far the most popular political figure in the state … yet it’s this unspoken part of the caucuses on the Republican side” that the presidential candidates need to keep their distance. Unspoken seems about right: In dozens of events in the 72-hour period leading up to the caucuses, hardly any candidate has mentioned Sandoval, a feat that would be difficult to imagine in South Carolina or Iowa, both primary states with (far less popular) Republican governors. Less than a year ago, Sandoval’s endorsement was seen as one of the biggest gets in Republican politics, second only perhaps to Haley’s. (Most still say it is—at least in the general election.) And during that time, according to those in the governor’s brain trust, nearly every candidate flew to Nevada to kiss Sandoval’s ring (including Marco Rubio, who topped off his pitch by borrowing a pair of Sandoval’s boots). The legislative session and the ensuing tax increases didn’t change that dynamic—it was the slow-marching dirge of the primary process, which has picked off most of the original governors whom Sandoval might have favored for president (his only statement regarding an endorsement has been to say that he prefers a candidate with “executive experience”). With Donald Trump and Cruz together registering at over 60 percent in a recent poll, Sandoval’s broad minded record suddenly doesn’t align well with the fire-and-brimstone message of the party’s presidential front-runners. The battle for Nevada is thus more evidence that the Republican Party is suffering an ongoing identity crisis—one that Trump is successfully exploiting. It wasn’t long ago that the party establishment publicly invested in the idea of Sandoval as a new kind of Republican—and let it be known that his name was supposedly on a variety of vice presidential short lists. Yet Sandoval, like Kasich in some ways, is living proof that today’s Republicanism looks very different depending on whether you are running for president or governing on the state level. For a party that makes frequent talk of allowing states to solve problems the government can’t, the inability of GOP voters to embrace their own successful governors—or former governors, Jeb Bush among them—may be another indication of how divided the party is. Cruz’s campaign could prove the best test case. Sources within the Cruz campaign suggest that, without mentioning Sandoval specifically (until recently), the campaign has been mobilizing conservatives who have soured on the governor as a key part of their rural turnout strategy. The campaign has already utilized a corps of legislators and public officials targeting disaffected Republicans; leading the charge is Attorney General Adam Laxalt—Sandoval’s tea party foil—whom operatives say remains enormously popular in rural counties. But even a cursory glance of Cruz’s endorsements, nearly all of whom opposed Sandoval’s agenda last session, leaves little to mystery. “That sense of betrayal is very strong in the Republican primary, among the average primary voter,” adds Hansen, the Cruz supporter, who described the Cruz campaign’s strategy. 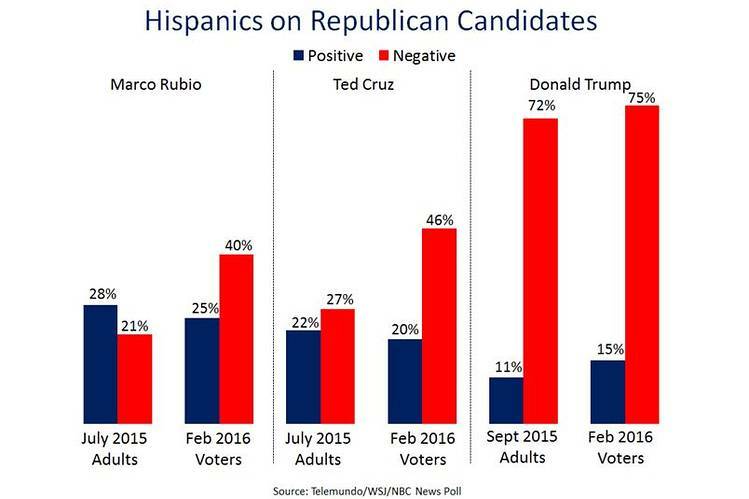 “That’s what Trump and Cruz have tapped into nationally. I think it’s stronger in Nevada because of this recent situation.” Unsurprisingly, the Cruz campaign’s core volunteers are “tea party people,” said one Cruz campaign staffer. Sandoval knows what it’s like to cater to the right-wing base in an election. He did it once himself. In 2010, Sandoval ran to the right of sitting Republican Gov. Jim Gibbons, trouncing him in the Republican primary by more than 28 points. Even then, Sandoval displayed early signs of independence from the state’s dysfunctional party structure: The night of his victory, Sandoval held his victory party at one hotel while the Republican Party’s victory bash was at another. But Sandoval’s first experience with taxes was to curtail them, or at least try, during the in his inaugural legislative session in 2011. A court ruling struck down (or complicated) his proposed budget. To his credit, Herzik adds, “Sandoval pivoted immediately.” And having learned quickly the hard lessons of governance, Herzk says, Sandoval was never quite the same: In 2013, when the same taxes came up for renewal, he persuaded key anti-tax legislators to get on board with an extension. Why did he reverse course? “You’ve got to sit in my chair,” Sandoval said, when I caught him after a meeting at the National Governors Association. I had asked which had moved first: Sandoval to the left, or national Republicans to the right. “You’ve got to walk in my shoes,” he continued. “Governing is very different. 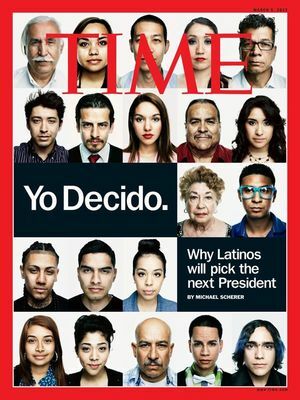 And being a chief executive who’s accountable for every single decision is very different than being a candidate.” Seated in a crisp, navy suit, he stretched in his chair to reveal charcoal leather boots with silver fringes (no spurs); Sandoval enjoys that most political of traits, a tendency to look even more handsome in person. With grayed temples and a broad, ceremonious jaw, he’s often compared to a Hispanic Mitt Romney. By most assessments, his job is one in which he’s doing well. Sandoval’s education overhaul is part of a broader agenda, that of economic diversification, in an attempt to free the state from matrimony to a single gaming economy. To that end, the state has made symbolic strides—attracting the car company Tesla—along with technical ones: Sixty months of consecutive job growth, 140 thousand returned jobs and an unemployment rate around 6 percent (compared to 14 percent, the worst in the country, when he won office). It’s a compelling case, depending on the audience. But it can’t free Sandoval from the paradox that could now limit his national appeal. The first is that the Republican Party has been hamstrung by its commitment to the idea of Sandoval as the future of the party. It might be more apt to say that he represents a part of its past: “Sandoval is an anomaly in 2016, because he’s functioning in Nevada like a center-right Republican governor 15 or 20 years ago,” notes Muro. 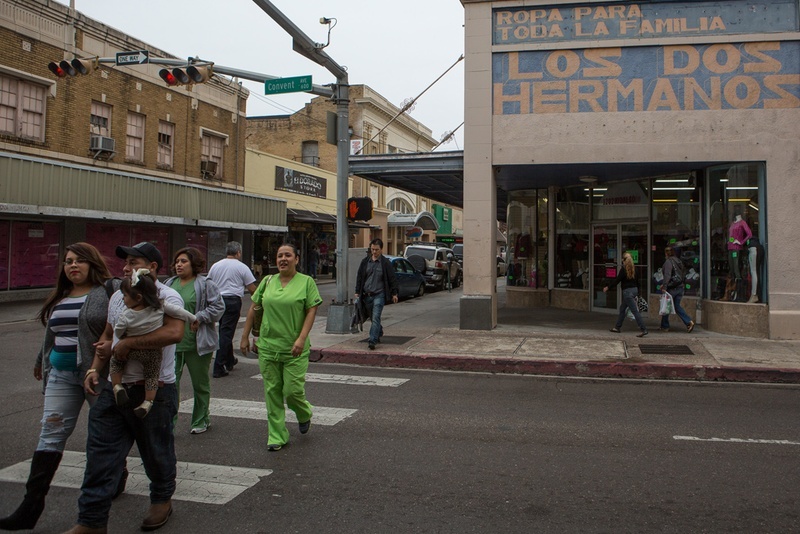 “That means a heavy focus on economic development and education. So he really is an unusual persona.” Approaching Year Two in the age of Trump, it’s not clear whether Sandoval has stock that is rising or falling inside the party. The strange stunting of Sandoval in his own state’s primary, like the collapse of his peer governors’ campaigns, might be part of the same nihilist undercurrent now infecting the GOP presidential stakes. Presidential candidates have leavened records otherwise bereft of substance since the invention of campaigns. But only in 2016 is accomplishing nothing no longer viewed as utility, but a commodity—and a precious one. Trump’s principle achievement in government is having had nothing to do with it; Rubio’s accomplishment seems to be leading an effort to fix immigration, abandoning it, and then denying it. And for caucus-goers in Nevada, the shuttering of the federal government, a fight led by Cruz himself, isn’t merely a negotiating ploy to get something in return for what they want. That is the thing that they want. Governors—especially the ones who think like judges—need not apply. Perhaps that is why one of the most popular Republican governors in the country can’t run on his record as a candidate for president, let alone endorse one. And maybe why the Republican slate’s chief executives—Chris Christie, Jeb Bush, Rick Perry, Scott Walker, and soon enough, Kasich—continue to fall away. It’s not that they don’t have strong records. As Sandoval must be wondering, while he watches his friends fall one by one, perhaps in 2016, they can’t afford to have a record at all.